Mr Bhagwat said Jammu and Kashmir has faced problems because of the "discriminatory provisions" in the state that has "denied fundamental rights". Article 370 of the Constitution grants special status to the state of Jammu and Kashmir. 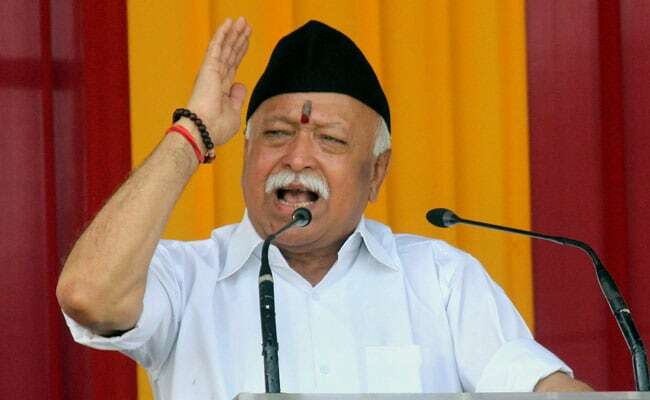 Nagpur: RSS chief Mohan Bhagwat has demanded "necessary constitutional amendments" for the people of Jammu and Kashmir to be "completely assimilated" with the rest of the country and batted for the rights of Hindu refugees in the state. In his more than an hour-long address on Vijayadashmi, which is also the Rashtriya Swayamsevak Sangh's foundation day, he spoke on a host of issues such as national security, Jammu and Kashmir, Rohingyas, cow protection, economy and agriculture. Backing the government's stand on the Rohingya issue, Mr Bhagwat said that they were a threat to national security due to their links with terrorist groups. 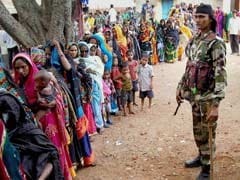 In Left-ruled Kerala and Mamata Banerjee-ruled West Bengal, "jihadi and anti-national" forces were at work and the governments there were not only indifferent but at times lending a helping hand to them to "appease" a section of the voters for "petty political interests", he said. Speaking about Jammu and Kashmir, Mr Bhagwat said, "Necessary constitutional amendments will have to be made and old provisions will have to be changed." "Then and then only, the residents of Jammu and Kashmir can be completely assimilated with rest of Bharat and their equal cooperation and share will be possible in the national progress," Mr Bhagwat said at the RSS headquarters in Nagpur. Though Mr Bhagwat did not mention it, but the Rashtriya Swayamsevak Sangh (RSS) and the BJP have long demanded abrogation of the Article 370, which grants special status to Jammu and Kashmir. The Supreme Court is also hearing a plea demanding repeal of Article 35A, which allows the state legislature to define "permanent residents". Political parties based in Jammu and Kashmir, such as the PDP and the National Conference are against any change in the special provisions granted to the state by the Constitution. Mr Bhagwat also batted for the rights of Hindu refugees living in the state, saying they have been denied citizenship rights unjustly, and sympathised with the cause of Kashmiri Pandits, who were forced to flee Kashmir in 1990 due to terrorism. "Despite being the citizens of Bharat, they (Hindu refugees) still don't have basic facilities of education, employment and democratic rights," Mr Bhagwat said. He said this was happening because of the "discriminatory provisions" in Jammu and Kashmir that has "denied them the fundamental rights". "The problems of permanent residents of state who migrated from the Pakistan-occupied Kashmir in 1947 and the people who were displaced from the Kashmir Valley in 1990 are remaining as it is," he said. The Sangh chief said there was an urgent need to take the benefits of development to the people of the state, including the Jammu and Ladakh regions, without any discrimination and through transparent and clean governance. Mr Bhagwat also rejected suggestions for considering the case of Rohingya Muslims, who have fled Myanmar, from a humanitarian view, alleging that they were being driven out of their country due to their "violent separatist activities", and links with 'jihadi' and terrorist groups. "Any decision regarding them should be taken keeping in mind that they will definitely be a threat to national security and integrity. The government seems to be thinking on the same line," he said. The Modi government has already told the Supreme Court that Rohingyas were not refugees but illegal immigrants and are a security threat. The government has said that it would send them back. Mr Bhagwat praised the government's firm action against separatists and terrorists in Jammu and Kashmir, saying that the situation prevailing there a few months back has improved. Lauding the people living in the border areas, he said they were "bravely and persistently holding ground amid incessant cross-border firing and terrorist-infiltration" and called for relief and assistance to them from the government and social groups. The RSS chief also praised the Centre for its handling of the Doklam issue with China. India's determined position on China and Pakistan has bettered its standing in the world, he said. In his speech, he also gave suggestions to the government on agriculture and economic fronts, observing that farmers were in "pain". Taking a dig at some 'intellectuals', he said that they did not find anything about India to be proud of. Mr Bhagwat also called for "decolonisation" of the mind and lauded the Modi government for its efforts. "We are independent for the last 70 years but for the first time we are experiencing" it and so is the world that India is rising, he said. Senior BJP leader LK Advani and Union minister Nitin Gadkari were present on the occasion. Dalit religious leader Baba Nirmal Das, who was expected to be the chief guest, could not attend the event as he was indisposed. His message was read out at the event. Referring to the issue of cow vigilantism, Mr Bhagwat said, "It is reprehensible that some people have been killed allegedly by gaurakshaks." "At the same time, many people have been killed by cow smugglers," he said. Mr Bhagwat said the issue of cow protection is beyond religion and "many Muslims have sacrificed their life for protection of the cow just as people of Bajrang Dal have". On the economic situation, the RSS chief said that the interests of small, medium industries and self-employed businesses should be protected as they make the "biggest contribution" to the economy. He also asked the government to ensure a minimum support price to farmers to allow them to make enough money to sustain themselves from their produce. "Our farmer feeds not just his family but the entire nation, is in pain today. He is depressed after facing the onslaught of floods and droughts, export-import policy, meagre pricing, mounting loans and losing everything once the crop is ruined," Mr Bhagwat said. Though the government has come out with many schemes, he suggested that efforts should be made to find how they have been implemented on the ground.